Sun Devil-mania was peaking and a change of the sunburst logo made the attractive ASU helmet even nicer-looking. The sunflower shell and one-inch maroon center stripe were now complemented by a sunburst logo similar to the '75 decal but this one afforded more contrast, with a maroon center and the sunflower colored ASU lettering appearing in the middle of the sun. With hopes of challenging for the national title, the let-down of a disastrous season was even greater. The only losing season Kush had known in thirty-one years as a player and coach was hinted at in the opening game 28-10 loss to UCLA and by the time Tony Mason's Cincinnati team had come in and defeated the Sun Devils14-0, they were 0-4. This impressive win for a supposedly inferior Bearcat squad secured the hiring of Mason as rival Arizona's head coach at the end of the year. Despite the presence of many talented players, Wyoming and BYU shared the WAC title as the ASU squad tumbled from the heights of '75 to a 4-7 finish. 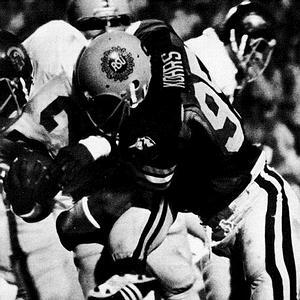 It seemed as if the tools for victory were in place: Dennis Sproul and Fred Mortensen still shared the QB duties, John Jefferson, despite injury, still caught forty-eight passes for 681 yards despite injury and had receiving help from Larry Mucker who was with Tampa Bay from ’77 through 1980. TE Bruce Hardy was still imposing as a blocker or receiver. Freddie Williams ran like the wind, completing his career with 3424 rushing yards and a total of seventeen 100-yard games to his credit while Danny Kush still kicked well. However the point production wasn't there as it had been in past years. DT Kit Lathrop and DE Al Harris led a defense that could not stop the run-option. Both Al Harris who was named to some All American teams and safety John Harris had outstanding seasons. John was All WAC and honorable mention AP All American with his seven INT’s. The only face-saving part of the season was the 20-0 whitewash of Arizona and the November announcement that both Arizona and Arizona State would leave the WAC and become full members of the PAC for the 1978 season. With newly expanded Sun Devil Stadium and impending entry to the PAC, 1977 needed to be a respectable year and Kush delivered more than that, a 9-2 season that dropped a bit to 9-3 with a Fiesta Bowl loss to Penn State by a 42-30 tally. 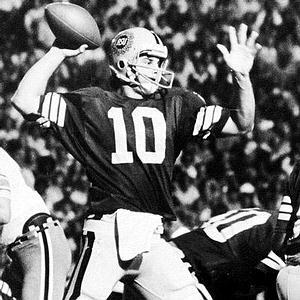 All WAC QB Dennis Sproul finished an excellent college career and tutored backup Mark Malone, then managed to squeeze in a few games with the Packers the following year. John Jefferson was an All American receiver and had a successful NFL career, starting it off with a bang when named NFL Rookie Of The Year in ’78. Former Sports Illustrated high school phenom coverboy Bruce Hardy who entered ASU as a highly touted QB and finished as a 240-pound tight end played twelve excellent seasons for the Dolphins, occasionally serving as their backup QB. “The Crunch Bunch” Defense still boasted a few of its original members with DE Al Harris an All WAC selection with 107 tackles and twenty-four sacks. Safety John Harris who went on to a dozen productive years in the NFL, primarily with the Seahawks, did get All America status and had a two-year double-digit punt return average. DT Kit Lathrop would begin his pro career in the NFL with Denver and Green Bay, gain attention in the USFL, and return to the NFL with the Chiefs and Redskins for two more seasons. The Sun Devils affiliation with the Western Athletic Conference was officially over as 1978 would find them stepping up in competition and into the PAC-10 with in-state rival Arizona. 1978 was a significant season. Elevating the level of competition by playing as a member of the PAC-10 with USC, UCLA, and Washington, filling an enlarged stadium, and maintaining the high level of play re-established in '77 were all obstacles for Head Coach Kush. A handful of excellent players faced the challenges well with junior Mark Malone at the QB controls. He had waited his turn and now tutored frosh Mike Pagel who saw time as his backup. Malone came into his own playing a great game against USC in a 20-7 victory where the defense put the sticks to the great Trojan tailback Charles White. Despite having Malone as their leading rusher with 705 yards, freshman HB Gerald Riggs of Bonanza H.S. in Las Vegas showed signs of brilliance. Chris DeFrance who made it with the Redskins briefly and John Mistler were effective receivers. On the defensive side Al "The Destroyer" Harris highlighted his final season with nineteen QB sacks, made every All American team, and then headed off to the Chicago Bears. He was well supported by Bob Kohrs on the other end, LB’s Vernon Maxwell and Jeff McIntyre who had a year each with the Forty Niners and Cardinals, and All PAC-10 DB Kim Anderson who enjoyed five solid seasons with the Colts. The finish was 9-3 and a win over Rutgers in the first Garden State Bowl in Giants Stadium. An ugly incident was alleged to have occurred on October 28, 1978 during the game against Washington. Punter Kevin Rutledge who transferred at the end of the ’78 season, filed a $1.1 million lawsuit against Kush and the University claiming mental and physical harassment including the charge that Kush had punched him in the mouth after a poor punt in that game. As an investigation was launched, Athletic Director Fred Miller and Kush clashed as charges were made that Kush was pressuring players and coaches to alter truthful testimony or avoid giving information. In a heated incident just hours prior to kickoff of the October 13, 1979 Washington game, Kush was fired. Allowed to coach his final game, the team upset the favored Huskies 12-7, Kush was carried off of the field by his players, and assistant Bob Owens was named Interim Head Coach. The 3-2 record posted by Kush was later amended to 0-5 as the use of ineligible players led to forfeit. Two years later, Kush would be found to be not liable in a case that altered the way in which coaches could and would treat their players. Kush was out of coaching for 1980, then moved to the Hamilton Tiger Cats of the CFL where he took the team to the playoffs. He became the head coach of the Baltimore Colts in 1982, going 0-8-1 and did not have much more success before he resigned in 1984 to then become the head coach of the USFL Arizona Outlaws. Kush was later inducted into The College Football Hall Of Fame and the playing field at Sun Devil Stadium was named in his honor, a fitting tribute for his contributions over twenty-one years to a program he handcrafted into a nationally known winner. On the field the Devils struggled to finish at 6-6 before the forfeitures were made, though Malone was a star. He completed his two years at the Sun Devil controls having thrown for 3459 yards and twenty-four TD’s. A first-round draft choice of the Steelers, Malone played with them for seven seasons, finished two years split between the Chargers and Jets, and then became a well-known sportscaster. Mike Pagel played an increasing role behind him and young end John Mistler showed promise catching 498 yards worth of passes. With Al Harris gone, the '79 defense was not the same although All PAC DE Bob Kohrs played with the Steelers for five years after being their second round draft choice. The linebacking was given stability by Ben Apuna who played with the Giants the next season and then with Toronto of the CFL, and his frosh brother Wayne. The 6-6 record, with the forfeitures was amended to 3-9 and the program was at a low point.